Today we're proud to announce a brand new monthly gaming event on Co-Optimus in partnership with the Halo Waypoint team. 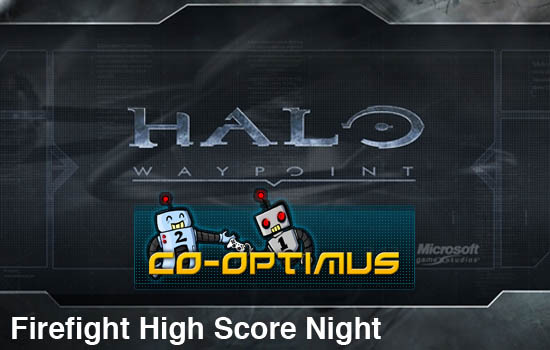 We're going to be running monthly themed Halo co-op nights that will be featured on the Waypoint channel on the Xbox 360. The first night is Halo 3: ODST Firefight Highscore Night, and the goal is simple. Your team is trying to achieve the highest score possible on any map, any difficulty. After the night is over, come back here and post your score, link the Bungie.net stats page and see how you did! We'll pick two winners each winning 1600 MS points and a 12 Month Xbox Live Gold subscription! One will go to the top score and one will go to a random selection from those submitting their scores. Don't forget to check out our Survival Guide for tips on Firefight! To participate in the ODST Co-Op Night you can add one of our cooptimus ODST gamertags (http://live.xbox.com/en-US/profile/profile.aspx?pp=0&GamerTag=cooptimus+ODST) or (http://live.xbox.com/en-US/profile/profile.aspx?pp=0&GamerTag=cooptimus+ODST2) to your friends list and utilize the friends of friends feature to invite other gamers to your Halo 3: ODST session. The Co-Optimus staff will also be sending out invites throughout the night getting groups together for some good ol fashioned Covenant slaying! Feel free to use our ODST meetup thread as well to meet other co-op gamers!